West Indies made good use of the lively pitch on offer to dismiss Sri Lanka for 200 in the first innings of the second Test that got underway at the P Sara Oval stadium in Colombo on Thursday. In reply, the visitors lost an early wicket before finishing at 17/1 on an incredibly slow day that saw only 71.5 overs being bowled. Both the teams featured debutants with Sri Lanka drafting in 20-year-old Kusal Mendis to join Dilruwan Perera as the two changes for the hosts to the side that won convincingly at the Galle with Lahiru Thirimanne and Tharindu Kaushal dropped. 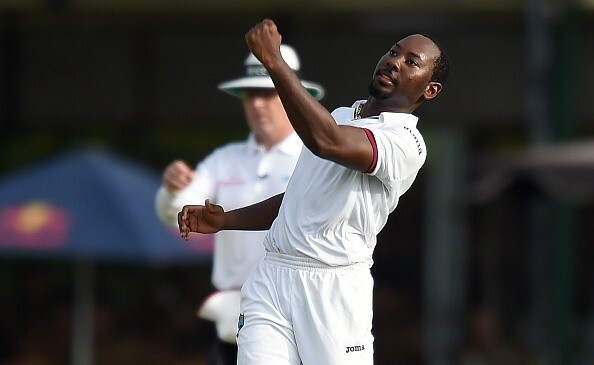 The visitors meanwhile handed a debut to promising left-arm spinner Jomel Warrican. Angelo Mathews’ decision to bat first on a pitch that offered early assistance to the faster bowlers backfired as West Indies’ three-pronged pace attack made early inroads. Jerome Taylor who was only playing after passing a late fitness test provided the early breakthrough dismissing Kaushal Silva for a duck in the opening over. The debutant Mendis could have followed suit soon after but had luck in his favour after Kemar Roach missed with his throw aimed at the stumps with the batsmen well short of the crease. Roach made up for it with the ball dismissing Mendis for 13 while Holder dented Sri Lanka further ending Karunarathne’s struggle at the crease. All the three wickets to fall were decided using the decision review system and the third umpire was called for once again as Holder got an outside edge off Mathews’ which travelled low to Kriagg Brathwaite fielding at second slip. After much deliberation, Marais Erasmus ruled in favour of the bowler to leave Sri Lanka struggling at 59/4. Dinesh Chandimal and Milinda Siriwardana tried to stage a recovery with a partnership in the second session, but the 31-run stand was brought to an end as Taylor returned to dismiss Chandimal who played on. Siriwardana, however, continued to maintain his composure as he forged useful partnerships with the Sri Lankan lower order and brought up his maiden Test half-century with two sixes off the bowling of Warrican. The left-armer had the last laugh however as he ended up picking four wickets, including the scalp of Siriwardana as Sri Lanka were bundled out for 200 with Herath stranded at one end unbeaten on a well-made 26. Dhammika Prasad hwoever provided an early breakthrough for the hosts sending Shai Hope back to the pavillion in the opening over. West Indies managed to survive without any further damage and will resume play on Day two trailing Sri Lanka’s total by 183 runs.